We got a nice surprise on Thursday when Matthew Rice ’05 stopped by the Hintz Family Alumni Center. 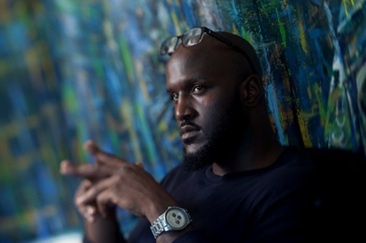 The former Nittany Lion defensive end, a member of the Orange Bowl-winning 2005 team, is back in town this weekend to speak to art students at a local middle school and promote the artwork he creates under the name Mateo Blu. If you don’t know (or don’t remember) Matthew’s story, there’s a great Q&A with him over at Fight On State that details his unique story: This is a guy who has not only thrived in the transition from football player to painter, but survived a brain tumor along the way. If you’re in town for the Purdue game this weekend, you can meet Matthew on Friday from 6-8 p.m. at Damon’s Restaurant, and from 11 a.m. to 2 p.m. Sunday at the State College Framing Company & Gallery, where he’s hosting a show of his work. He’s a personable and talented guy. We’re glad to have him back in town. This entry was posted in Uncategorized and tagged Fight on State, Hintz Family Alumni Center, Mateo Blu, Matthew Rice. Bookmark the permalink.